Choose your favourite UAE football club. 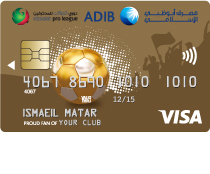 If you love the beautiful game, ADIB brings you the ADIB Football Card. (2) 20% of annual fee collected will be donated to Football Club printed on your Card.